Seco Tools Australia has introduced a new disc milling cutter to its highly successful 335.25 cutter range. Seco’s proven 335.25 disc milling cutters feature a fixed pocket design; the new model offers greater flexibility with adjustable cutting widths ranging from 21mm to 32mm and diameters from 125mm to 315mm. Seco’s adjustable pocket disc mill cutters are designed for application versatility in milling processes. 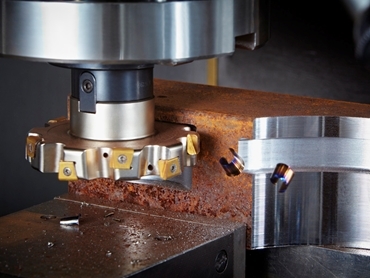 Key features include a unique insert geometry and cutter design that reduces cutting forces and optimises chip flow for a quieter, more productive and more reliable machining operation. Advantages also include strong performance in slotting operations and highly productive back facing, circular and helical interpolation and plunging. Replaceable cassettes used by the new disc mill cutters allow users to quickly and easily adjust the width of cut with precision. A special coating on the cassettes ensures extended durability while a choice of two different sizes provides optimised chip space and number of teeth according to the cutter diameter. The cutter’s cost-effective inserts feature four cutting edges with corner radii ranging from 0.8mm to 6mm; the integrated wiper flat helps achieve a fine surface finish. Seco’s disc mill cutters come in a complete range of geometries and grades (MP2500, F40M, MK2050 and H25), making them ideal for use on a broad range of materials.